Semiconductor intellectual property provider ARM Holdings has recently been promoting a "big.LITTLE" strategy, which enables System on a Chip (SoC) design to be based on multiple heterogeneous core processors that share the same architecture, but are scaled to fit the needs of various performance level tasks. For highest performance, ARM has introduced their Cortex-A15 MPCore™ processor, which designers can mix with the Cortex-A7 for maximum energy efficiency. ARM is now similarly increasing the options for integration of graphics processor cores, with the addition of the Mali-T658 to their next-generation Midgard family of GPUs. has used in their Galaxy SII smartphone. 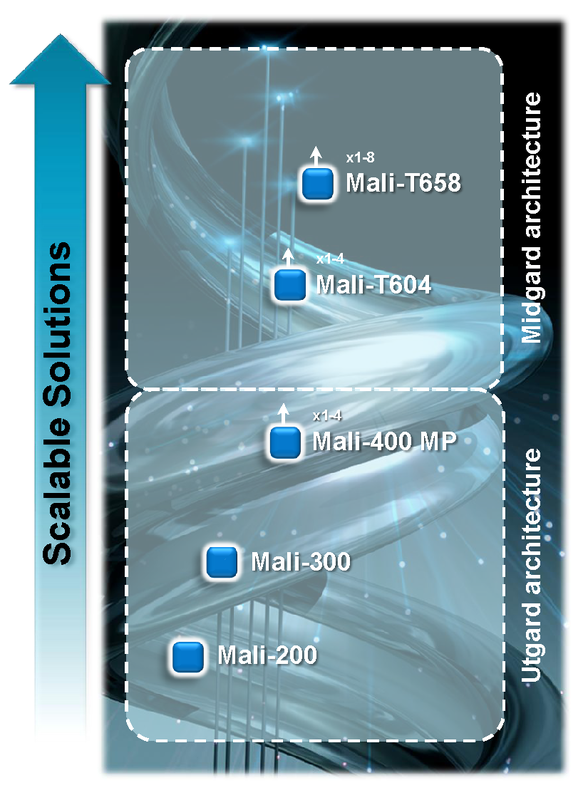 The Mali-T658 is the 2nd configuration that ARM has launched in their Midgard architecture, which the company targets at high-end applications, following on the Mali-T604 introduced at TechCon last year. 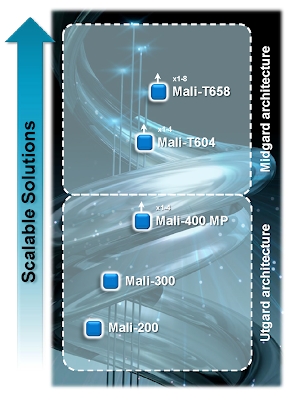 Devices based on Midgard are still in development, while Samsung has introduced the Galaxy SII smartphone which incorporates a quad-core Mali-400 GPU based on the lower performance 1st generation Mali Utgard architecture. Jem Davies, Fellow and VP of technology in the Media Processing Division at ARM, says that Mali-400 has also done very well in the Smart High-Definition TV market. Besides addressing the increasing demand for high-definition graphics in mobile devices, Davies foresees the Mali Midgard GPUs serving as the compute engines for a range of applications that can benefit from a high degree of parallel processing, extending the notion of the right core for the right task. He says that the ability to use the Mail-T658 in an 8-core configuration will make it suitable for use in High-Performance Computing (HPC) applications such as cryptography, speech recognition, and computational photography. Although not the main focus of ARM's strategy, Davies says that fundamentally there is no reason that Exascale computing could not also be a target for the Midgard GPUs, a market where ARM-licensee NVIDIA has been making a major effort. In HPC, power consumption is still a critical issue, but at the scale of MegaWatts of electrical usage. It is interesting that ARM has timed their GPU announcement for the same week that NVIDIA has finally officially announced Tegra-3, after that company published several key pieces of their 5-core variable symmetric multiprocessing (vSMP) architecture in recent months. The Tegra-3 integrates four 1.3GHz Cortex-A9 cores that can be operated in various configurations to maximize power efficiency, with a 5th core of the same ARM v7 architecture to handle lower performance tasks at up to a 500MHz clock rate - a prime example of ARM's big.LITTLE vision. Tegra-3 also integrates a 12-core NVIDIA GeForce GPU. Ian Smythe, Director of Marketing for Mali, says that the Mali-T658 is currently in the hands of several of ARM's partners who are just beginning to develop SoCs. Whereas ARM designed the Mali-T604 to be scalable from 1 to 4 cores, the T658 can be used in configurations of 1 to 8 cores, split into two parallel groups of 4 cores that each share a L2 cache. Smythe and Davies says that users can expect to see 4X the T604 performance from doubling the number of GPU cores in the T658, along with the doubling of the number of arithmetic pipelines that ARM has incorporated into the new design. They say that the Mali-T658 will provide a 10x performance increase over the Mali-400. 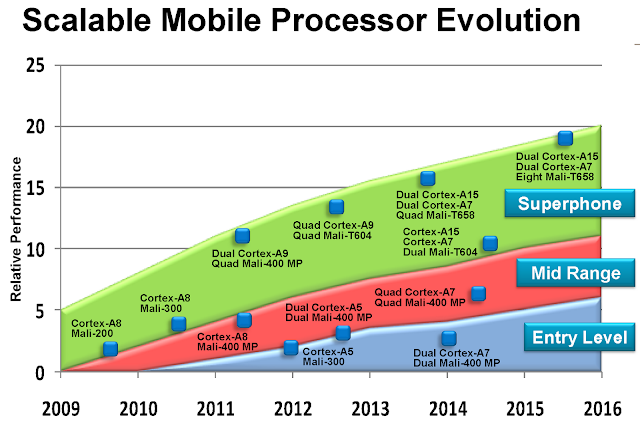 ARM's vision for the Mali-T658 multi-core GPU extends to an octal configuration, in 22nm processes, in 2015. Davies could not reveal any data concerning a power consumption comparison between T604 and T658, except to say that doubling power in order to double performance would not be accepted by their customers, so that ARM must get more efficient. Although ARM's customers will fabricate the Mali cores in a variety of semiconductor processes, Davies expects that the full 8-core configuration will not be utilized until 22nm processes come online. ARM expects a 5-year lifetime for the Midgard architecture, and their future vision for SoCs with octal GPU configurations goes out to a 2014-2015 timeframe. Davies expects customers to first take advantage of the increased arithmetic capability in the Mali T-658, before employing a parallel expansion with more cores, depending on how much silicon area they wish to dedicate to graphics. ARM emphasizes that the Mali T-658 cores have been co-designed, co-verified and optimized from a system point of view, so that they will play seamlessly with the Cortex-A15, Cortex-A7 and the use of CoreLink Cache Coherency. The 64-bit architecture is ready for the recently announced ARMv8 64bit CPU architecture.